In other news, check out my vegan chocolate cake recipe on Instructables! I wrote about it here once upon a time, but decided to enter it in their cake contest. Vote for me? Well, I haven’t been crocheting lately either, but that’s because I have to move next Tuesday and all my yarn and hooks are packed! It’s a very stressful time and I haven’t any therapy! I wish I was blocked, but my fingers are itching. How about a bowl of cheerios? A jello mold? 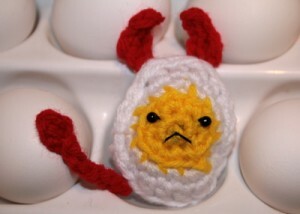 I love crocheted food. But maybe the moving theme would be more helpful? Cardboard boxes are boring, how about bubble wrap? A life sized hand truck? A Crochet piece of poop…With a fly on it. do you have that one yet? Funny you wrote this post… My friend this weekend told me about a crochet poop with a fly on it and I am totally envious of her purchase. I would love a corchet poop. I think you are such a crochet maven that you should write a guide on guidespot.com about crochet in the city… Now that is a clever idea, no blockage there! Ok, if you make the poop let me know, I want one! clearly, if there are deviled eggs, there should be angeled eggs too! Also, have you considered doing crocheted cocktails? clearly glasses with stems would be problematic, but I can imagine some possibilities for crocheted cocktails with pipecleaner umbrellas or something. for somethig really random, what about a crochted sock monkey? (or have you dome that already? ?…) …anyway, what if you made something really simple that you could make a lot of in differnt colors/ patterns? i’ve done that with the gabu pattern at http://www.roxycraft.com, and they all look really cool toghter.